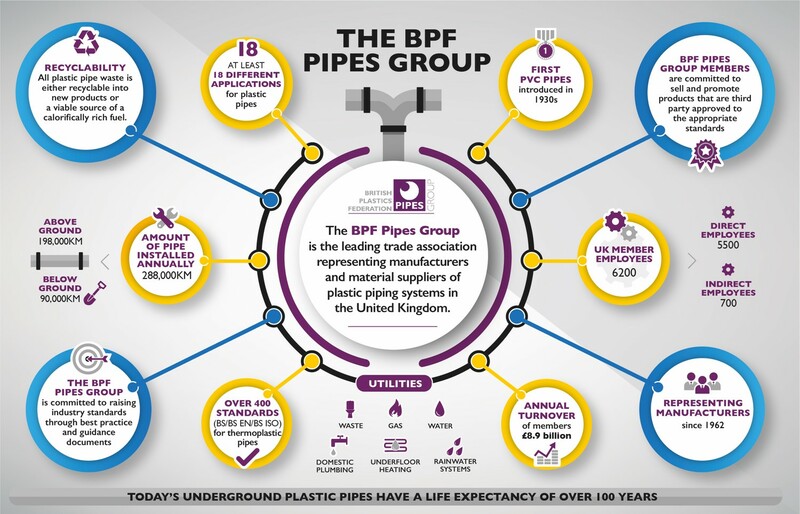 The BPF Pipes Group formed in 1962 is the trade association representing manufacturers of plastics piping systems in the United Kingdom. BPF Pipes Group members are committed to sustainable construction. The importance of plastics as a material for pipework continues to grow. Plastic pipework embraces the full spectrum of above and below ground, pressure and non-pressure applications. The British Plastics Federation (BPF) Pipes Group is the leading trade federation of the UK plastics pipes industry and a member of the European Plastic Pipes and Fittings Association (TEPPFA). Access information resources in the form of News Articles, Guidance Notes and Position Statements which cover areas of interest to specifiers, manufacturers and installers of plastic pipe systems.